As a follower of Martin Lewis, I’ve got a lot to thank him for, saving me money overtime. However, consumers have adopted what we’re calling the Martin Lewis culture. The right to complain about every single bill a customer receives and withhold payment, with the right to threaten contacting Martin Lewis. 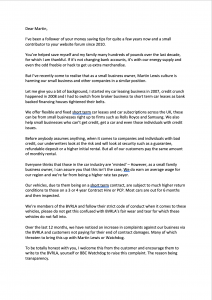 After another day, with another email threatening this, I have decided to take a leaf out of Martin Lewis’ book and write an open letter, for which I hope he reads. It’s extremely difficult running a small business, working out the hours worked and the money earned. We could actually earn more working in an alternative role. I’ve been a follower of your money saving tips for quite a few years now and a small contributor to your website forum since 2010. You’ve helped save myself and my family many hundreds of pounds over the last decade, for which I am thankful. If it’s not changing bank accounts, it’s with our energy supply and even the odd freebie or hack to get us extra merchandise. But I’ve recently come to realise that as a small business owner, Martin Lewis culture is harming our small business and other companies in a similar position. Let me give you a bit of background, I started my car leasing business in 2007, credit crunch happened in 2008 and I had to switch from broker business to short term car leases as bank backed financing houses tightened their belts. We offer flexible and fixed short term car leases and car subscriptions across the UK, these can be from small businesses right up to firms such as Rolls Royce and Samsung. We also help small businesses who can’t get credit, get a car and even those individuals with credit issues. Before anybody assumes anything, when it comes to companies and individuals with bad credit, our underwriters look at the risk and will look at security such as a guarantee, refundable deposit or a higher initial rental. But all of our customers pay the same amount of monthly rental. 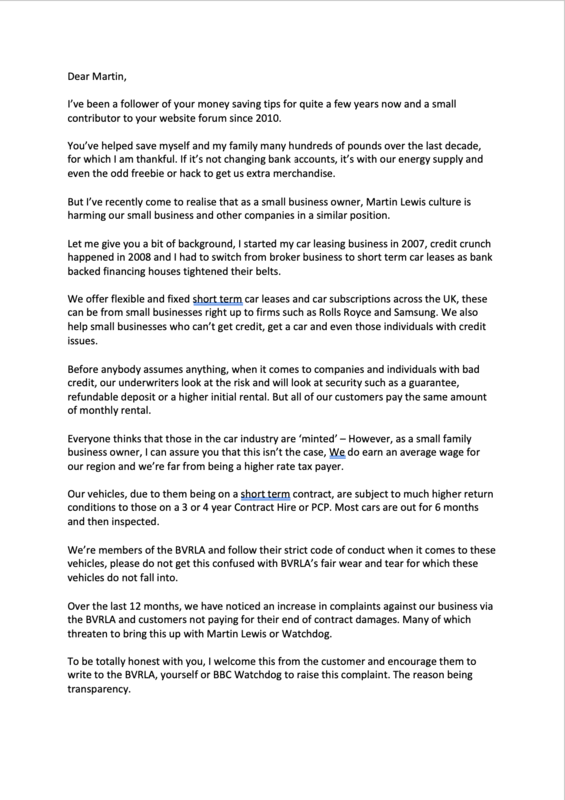 Everyone thinks that those in the car industry are ‘minted’ – However, as a small family business owner, I can assure you that this isn’t the case, We do earn an average wage for our region and we’re far from being a higher rate tax payer. Our vehicles, due to them being on a short term contract, are subject to much higher return conditions to those on a 3 or 4 year Contract Hire or PCP. Most cars are out for 6 months and then inspected. We’re members of the BVRLA and follow their strict code of conduct when it comes to these vehicles, please do not get this confused with BVRLA’s fair wear and tear for which these vehicles do not fall into. Over the last 12 months, we have noticed an increase in complaints against our business via the BVRLA and customers not paying for their end of contract damages. Many of which threaten to bring this up with Martin Lewis or Watchdog. To be totally honest with you, I welcome this from the customer and encourage them to write to the BVRLA, yourself or BBC Watchdog to raise this complaint. The reason being transparency. We make our money from the monthly rentals, we don’t upsell end of contract charges and whatever our suppliers levy as the reasonable charges we pass to the customer, along with a small admin charge. I’d say a large 75% of the customers argue this, for which we spend a lot of time sending over the images, collection sheets and our return conditions booklets (which already get sent out with the car and form part of the contract). From this 75%, I’d say a good 25% raise a complaint with the BVRLA for which we’ve currently had 100% upheld. From these only 5% have paid. For those customers who have not raised a complaint, we have regretfully had to start court proceedings against the customers to recover the money, for which this is not guaranteed, or the payment plans in place, mean we could reach retirement age before we’ve actually received the money owed. For example, one customer owes us just short of £5,000 and is paying back £10 per month. This is just my story, however, I have heard several similar issues from many other small business owners including wedding photographers, training providers, accountants and small shop owners. What I’m asking is that for those small businesses who do offer an honest and transparent service, is for customers to see this. As a family owned business, it’s very difficult to absorb costs for the damage and then the further legal action, especially to get nothing back. A few damaged alloy wheels and a damaged door or wing literally wipes out the 6 months profit and more, then the time spent on that customer really isn’t taken into account. A lot of the time leaving us with a negative balance. I’m sure if you knew that customers used ‘Martin Lewis’ every time they disagreed with a bill, it would annoy you more than people who use you to endorse investment programs on Facebook or Google Adsense. 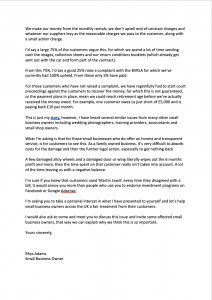 I’m asking you to take a personal interest in what I have presented to yourself and let’s help small business owners across the UK a fair treatment from their customers. I would also ask to come and meet you to discuss this issue and invite some affected small business owners, that way we can explain why we think this is so important.